As part of our income-generating housing initiative, E+O has developed construction materials and modular designs that are affordable as well as durable (25+years). They have been tested to withstand 8.5 earthquakes and 127 mph winds. We have also trained a core team of carpenters in how to build these structures in a matter of days. In addition, we have worked with local partners in India to create and deliver safe construction training workshops for builders, carpenters and masons, as well as for housing finance institutions and consumers. E+O recognizes that a holistic approach involving everyone in the construction of a house and/or workplace is the only way to ensure that the safe construction loop can be closed. 1.6 billion people live in substandard housing worldwide; in South and Southeast Asia, 167 million people live in dwellings made from temporary materials. As workers in the developing world flood urban and peri-urban areas to take advantage of manufacturing jobs, they struggle to find housing. They are locked out of real estate developments, have no access to housing finance, and are left with little choice but to build their houses themselves. 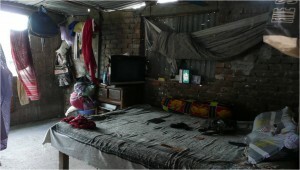 These structures are unsafe, unhygienic, with very little light and ventilation. Maintenance costs are high, which eats into disposable income. We partner with ARUP to optimize our housing initiative’s designs and manufacturing process to ensure that our modular structures are safe, as well as easy to build. With the generous support of the Cisco Foundation, we have created a mobile outreach platform that enables us to contact builders and laborers, as well as housing finance institutions and their clients, to offer targeted safe construction training workshops. E+O is now working to scale our safe construction work by employing a variety of technologies, including a mobile communications platform and multi-media information kiosks.